PrevPrevious2 Years of Beer – Let’s Celebrate ! We are OPEN EVERY DAY during the summer school holidays (except Christmas Day) 2pm – 6pm. Enjoy a our tasting paddles of genuine, uniquely local craft beers with friends, and grab some freshly filled takeaways. We are a family friendly production facility, allowed to sell 100ml tastings & takeaways (1L cans, 2L ‘growlers’, 19L & 50L kegs). Brewery tours are possible by pre-booking (ring Nigel 0447 631115). You are welcome to BYO nibbles/picnic. Please NOTE our license has restrictions including limited cellar door numbers each day, so bookings are appreciated. If we exceed our allowable number of patrons for the day then we will have to close early on that day – we apologise in advance if this has to occur. Can’t make it during our normal hours?…then give us call, as when possible we are happy to open for groups or order pick-ups (ph 0447 631115). 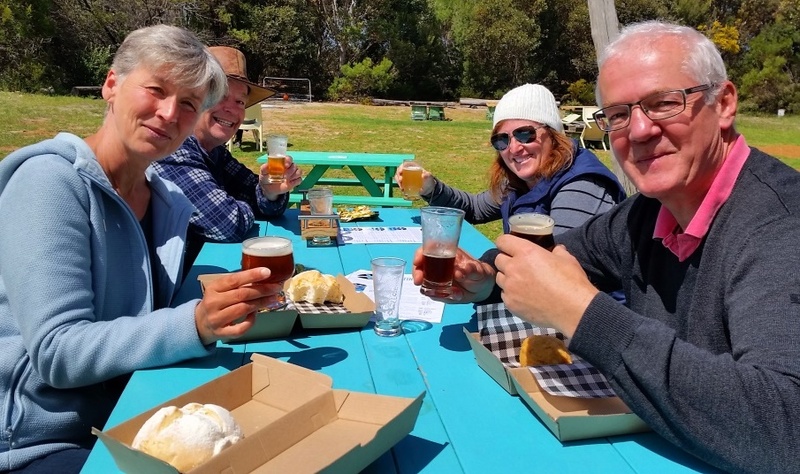 Enjoy tasting genuine, uniquely local craft beer with friends at Lucky Bay Brewing.